This public service announcement was originally posted on the official website of the World Health Organization. As of writing, over 4,300 measles cases have been officially reported by DOH with 70 deaths from 1 January to 9 February 2019. DOH has reported rising measles since last year with 18,407 cases in 2018 compared to 2,428 cases in 2017 – a nearly 8-fold increase in measles cases. 2. Why are there measles outbreaks in the country? When a community has low immunization coverage, the likelihood of measles outbreak increases. An immunization coverage of 95% amongst all children is needed for a community to be fully protected against measles. This includes protection for the vulnerable members of the population such as infants that are too young to receive vaccination, people who have weakened immune systems, and older adults. The Philippines has seen a decline in the first dose of measles vaccine in the past decade – from above 80% in 2008 to below 70% in 2017. Initial figures for 2018 indicate further decrease. As a result, many children have become susceptible to measles infection. WHO estimates that 2.6 million children under the age of 5 years in the Philippines are not protected from measles. As long as routine immunization remains low in the Philippines, the country will experience periodic measles outbreaks. 3. Why is there low immunization coverage in the Philippines? There are multiple factors that may contribute to the low immunization coverage in the Philippines. 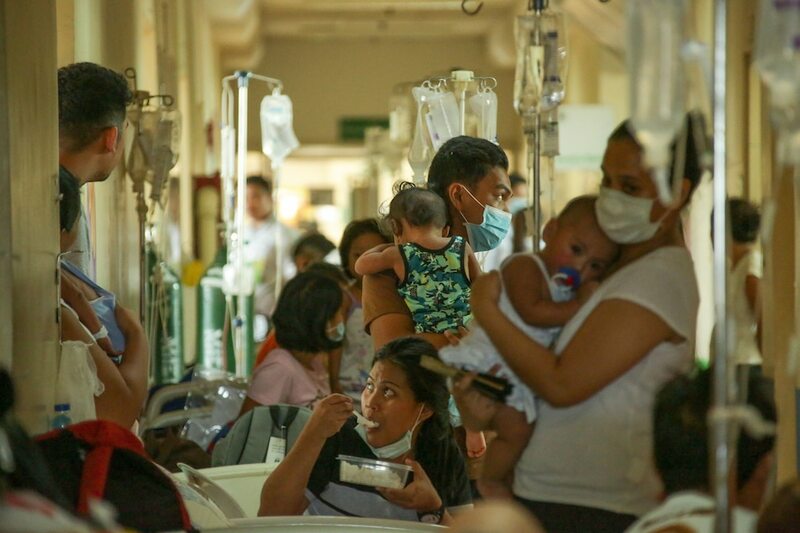 Inadequate service delivery continues to be a concern, including less than optimal number of immunization sessions at the primary care level and accessibility issues especially in hard-to-reach areas in the Philippines. Vaccine confidence has also decreased in the Philippines following the dengue vaccine (Dengvaxia) issue. A recent study from the London School of Hygiene and Tropical Medicine documented that those believe “that vaccines are important, are safe and are effective” dropped from close to 100% in 2015 to 60-80% in 2018. This reveals a critical need to combat misinformation and improve public understanding of the critical importance and safety of vaccines. 4. What can parents and caregivers do to protect their child against measles? Vaccination is the most cost-effective protection against measles. The measles vaccine has been proven to be safe and effective and have been used in the routine immunization programme in the Philippines since the 1960s. Under the routine immunization programme, there are free vaccines available at the health centres for children, with the first dose given when a child is 9 months old and the second dose given when a child is 12 months old. During a measles outbreak setting, WHO recommends children 6 months old and older should be vaccinated. For those whose children are still less than 6 months of age, the best thing to do is to be vigilant of ongoing measles infection in the community and limiting the exposure of the child to anybody other than primary caregivers. Parents must ensure that their older children are vaccinated against measles to also provide some protection, as they will be unable to pass the virus on to their infant brother or sister. 5. What can parents and caregivers do if they think their child has measles? The typical symptoms of measles are rash and fever, accompanied by any of the following: cough, runny nose, or red eyes. If you think your child may have measles, the best thing to do is get in touch with your local health worker to ask their advice on whether to be seen at a health facility. It is important to bring your child to a health facility quickly if the child is very young, has high fever after more than 3 days of rash onset, or other signs of severe infection such as breathing difficulties, confusion or convulsion, and diarrhoea. If your child doesn’t have severe symptoms or complications, it may be sufficient to take care of your child at home. Suspected measles cases should not be hospitalized unless necessary because of the high risk of transmission in the health facility. In mild cases isolate your child at home for at least 4 days after rash onset. It will be helpful to keep the child well fed and hydrated and vigilantly observe for signs of possible development of severe measles. Only primary caregivers or siblings with documented history of measles vaccination or past measles infection should be exposed to the infected child. Since the signs and symptoms of measles are similar to dengue, parents should observe if the child is showing other symptoms indicative of dengue infection, such as nose bleeding, abdominal pain, and joint pain. 6. What are the risks to pregnant women if infected with measles? If a woman is not immune to measles and becomes infected while pregnant, she may face following risks: miscarriage or stillbirth; the baby to be born prematurely (before the 37th week of pregnancy); the baby having a low birth weight. Pregnant women who have not received the vaccine should take extra care to avoid exposure to possible infection. 7. Should pregnant women get vaccinated against measles? Measles vaccination should not be given to a pregnant woman due to risks to the baby. In addition, women who got the measles vaccine should wait 4 weeks before getting pregnant. 8. Can breastfeeding mothers breastfeed if they have measles? If a nursing mother is diagnosed with measles, she should temporarily discontinue breastfeeding. However, expressed breastmilk can be given to the infant. 9. What can health workers do in this situation? Health workers can help reduce measles deaths through rapid clinical diagnosis and adequate clinical management. This includes giving the necessary symptomatic treatment such as adequate fluid intake for treatment of dehydration, prescribing antipyretics for fever, antibiotics for any secondary infections and providing Vitamin A supplements. Health workers should ensure that they have been vaccinated against measles, to avoid becoming infected themselves, and inadvertently spreading the infection to their patients. Health workers should also report, monitor and follow-up all suspected measles cases. 10. What is the DOH doing to address the measles outbreaks? Since April 2018, the Department of Health launched the measles immunization campaign called “Ligtas Tigdas” to address the rising measles cases in the Philippines. DOH has expanded the campaign to particularly reach “defaulters” or unvaccinated children under 5 years old. DOH is closely working with partners such as the Philippine Red Cross, UNICEF and WHO to strengthen its outbreak response activities. DOH and its partners are also doing a nationwide information campaign through traditional media, social media and community mobilization to increase awareness about measles prevention. 11. What support is WHO providing regarding the measles outbreaks? WHO has provided technical and some funding support to the National Immunization Programme of the Department of Health in the planning, implementation and monitoring of measles outbreak response activities. WHO is in close coordination with DOH to help in the effective implementation of the measles vaccination campaigns to ensure the outbreak is contained.